Young country girl Laura Timmins leaves her friends and family in the hamlet of Lark Rise to start her first job at the post office in nearby town Candleford. 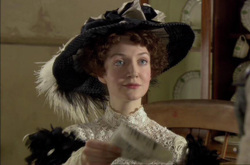 Postmistress Dorcas Lane gives Laura a warm welcome but other residents of Candleford aren't so generous. When Lark Rise residents challenge the post office's 'eight mile rule' that forces them to pay for delivery of telegrams, Laura finds herself torn between communities. Postwoman Mrs Macey receives news that her husband Dan has escaped from prison. 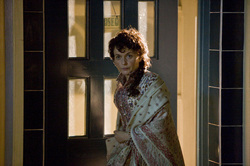 Before long the whole town is alight with gossip, and Mrs Macey fears that the damage to her reputation will force her to leave Candleford. Meanwhile, her son Freddy has been secretly meeting a mysterious stranger in the woods. Episode 3 When local widower Old Amos announces his engagement to his maid Patty, the town become suspicious that she may just be after his money. Robert refuses to let his children sing a song in praise of the Tories at the local church concert, which results in them being banned from the concert altogether. Robert's stubbornness incurs the wrath of his children, family and even the village. 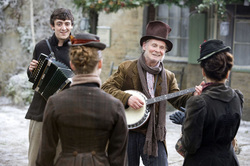 A strange old man arrives in Candleford looking for his estranged daughters - who turn out to be Ruby and Pearl Pratt. Horrified to see him out in public, playing scams on the local residents, the girls must decide whether they can forgive him for deserting them when they needed him most. Meanwhile, Caroline is being pursued by a bailiff collecting debts for the brewery. Dorcas is thrown by the surprise arrival of a new Post Office inspector, Mr Rushton, who starts to unearth anomalies in the way Dorcas runs the Post Office. Robert has been carving a decorative angel on the schoolhouse for which he is not getting paid. Episode 6 Robert takes pity on a homeless family and brings them to stay at his house for the night. In the morning the family have departed, leaving their little daughter Polly behind. Lady Adelaide meets the girl and falls in love with her, wanting to adopt her, but Sir Tim thinks that adopting Polly would be inappropriate. Tim takes Polly to the Post Office where everyone struggles to think of a solution to the problem. Twister's delusions grow worse as he sees visions of his dead sister, and Queenie worries about his health. The residents rally around Susan Braby when they realise her husband Sam has hit her. Meanwhile, Timothy commissions Matthew to make new gates for the manor, Adelaide becomes frustrated with how much time Tim is spending with Dorcas and decides to cancel the order for the gates, and Laura brings Phillip home for tea. Episode 8 A violent storm hits Lark Rise and Candleford, and the arrival of a new teacher, Mr Delafield, causes divisions in the two communities. Mr Delafield's radical views raise plenty of eyebrows in Candleford, while in Lark Rise he endears himself to the residents. When Dorcas delivers some books to Mr Delafield they initially rub each other up the wrong way, but this tension soon turns to chemistry. Episode 9 .Queenie finds a beautiful embroidered panel on a grave that has the residents of Lark Rise and Candleford intrigued. Twister starts dreaming of everything he could buy if they sold the panel, while Dorcas and Sir Tim set about getting to the bottom of the mystery of who created it. Alf and Phillip's rivalry continues. It is Zillah's birthday and all her friends and locals visit the post office for a party. Tensions mount between Dorcas and Sir Tim as painful truths about the past begin to surface and Dorcas decides to sell the post office. Phillip becomes increasingly possessive of Laura and she expresses doubts about their relationship. 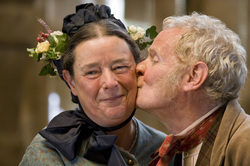 Episode 1 Lark Rise and Candleford are transformed as the inhabitants prepare for the Christmas festivities. 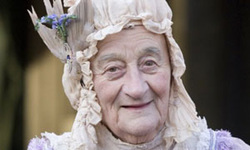 However, loyalties are tested as the arrival of the ghost of a ragged, bare-footed young woman drives residents to speak difficult truths amid the gift giving and carol singing. Episode 2 James Dowland is the new man in town who takes the woes of the Lark Rise tenants under his wing. He also takes the heart of Dorcas Lane into his keeping, while putting Candleford on the map with the opening of a new hotel. Robert Timmins is suspicious of Dowland's motives, and is less than accepting of his financial help. Emma Timmins and the other Lark Rise tenants are, however, more than happy to see the return of a once Lark Rise boy. Meanwhile, Dorcas has her own heart strings pulled with her new maid, Minnie. Minnie can do no right; she means well, but with her troubled past she struggles to contain her excitement, testing Dorcas and those around her to the end. Battling with conflicting emotions towards new arrival James Dowland, Dorcas Lane sets out to defeat the dashing property developer in the parish council elections. Meanwhile, the grind of making ends meet in Lark Rise proves too much for Robert and Emma Timmins, and Robert's reluctance to change grows stronger. Episode 4 The death of Miss Ellison's father unites the communities of Lark Rise and Candleford, but amid the sadness Miss Ellison is confronted by her brother George, whom she blames for her father's death. Overwhelmed with grief, Miss Ellison is oblivious to Thomas Brown's affections for her and his desire for her hand in marriage. Eventually Thomas assists in effecting a reconciliation between brother and sister. Time rests heavy on the residents of Lark Rise and Candleford, as baby Annie Timmins stirs up emotions of days gone by and loves yet to be found. And with Emma Timmins feeling the strains of family life, Dorcas Lane offers to lend a helping hand, unaware of the consequences that her generosity will bring. Episode 6 Lark Rise and Candleford rally round to show support for Laura's new role in the post office when Dorcas Lane is taken ill, but Laura feels pressure mounting when anonymous letters begin to arrive. Minnie sees the delivery of one of the letters, and fears that her past is catching up with her. Dorcas and Laura help Minnie to escape the threat presented by her brutal father. Lark Rise and Candleford anticipate with the inauguration of a clock, paid for by James Dowland. 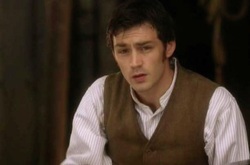 But when Robert Timmins loses his stonemason's tools, his means to work is lost, and there is a possibility that Fisher Bloom may leave Candleford unless Laura can find a way to stop him. Episode 8 The hot summer brings a surprise visitor to Candleford in the form of Celestia Brice Coulson, who stays at the Golden Lion Hotel and becomes acquainted with Dorcas Lane. Dorcas has other things on her mind, however, when she begins 'walking out' with James Dowland. And in Lark Rise, Emma's father, Old Edmund, arrives for his birthday. But problems arise when Emma asks him to live with them permanently. A feud between Lark Rise and the neighbouring village of Fordlow has been simmering for three generations, but it takes young love to bring the two communities together and save the day. In Candleford, the path of true love runs less smoothly for Thomas and Miss Ellison; will they ever set the date for the wedding? Episode 10 Every autumn, Constable Patterson is used to his wife taking to her bed with a mysterious illness. But this year is different, as she gives him permission to seek a new wife. The constable has no intention of doing any such thing, until a Pratt sister in distress sets his heart soaring, however the other sister grows jealous and angry, especially when her sister is presented with a very unusual present. A sudden storm reveals a secret romance, but also makes the address on a letter indecipherable. When Dorcas pursues the identity of the letter's recipient, she reveals another secret: a child, kept hidden even from his own father. James Dowland is confined to his hospital bed when his son arrives in Candleford, and Dorcas welcomes the boy into the post office, doing everything she can to make him feel at home. But this causes a great deal of turmoil when James is released from hospital to be reunited with his son.